Rep. Alexandria Ocasio-Cortez's (D-NY) Green New Deal is so farfetched that Senate Majority Leader Mitch McConnell is allowing a vote on it. He wants Americans to see which Democrats are actually foolish enough to actually support it. A few of the Green New Deal's provisions include: "upgrading all existing buildings," "overhauling transportation systems" to reduce carbon emissions, and getting to a point where air travel stops become unnecessary. Ocasio-Cortez, who introduced the plan last week, is adamant about its demands because she believes if we don't start getting serious about climate change the world may end in 12 years. Yes, she said this. Even leading Democrats like House Speaker Nancy Pelosi and Sen. Mazie Hirono (D-HI) told Ocasio-Cortez she was in over her head. Pelosi casually dismissed the "green dream or whatever," telling press it was not exactly at the top of her list of House priorities, while Hirono wondered how that whole reduced air travel would work for her state of Hawaii. 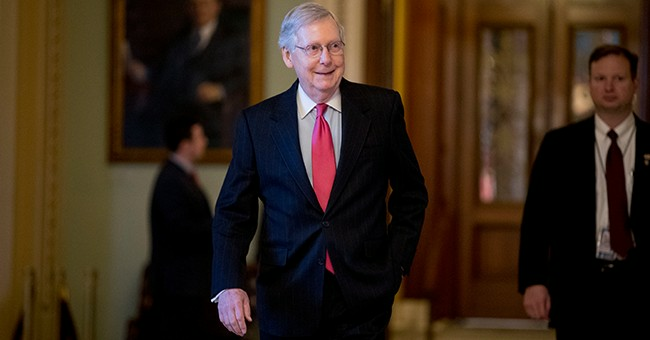 Several of the 2020 presidential contenders have come out in support of the measure, but McConnell is eager to see which of them "go on record" with it. Other Republicans are prepared to watch with glee. The fact that the Green New Deal also eliminates new carbon-free nuclear energy indicates this plan is not about carbon emissions. It’s about destroying our economy so they can build a socialist one. To Dems’ credit, at least they’re being more honest about their extremism.